This lovely, two-bedroom apartment in Barcelona, located in the centric neighborhood of Eixample, is the ideal base for your time to the Catalan capital. With a metro station, tram station and several bus stops nearby, the apartment offers easy access to all of Barcelona. Here you’ll be close to many top-rated bars and restaurants, as well as just a few steps away from the Diagonal street, home to plenty of high street and designer stores. The apartment welcomes guests upon arrival with a modern yet homey design. The living/dining area consists of a comfortable double sofa bed and a flat screen TV, perfect for relaxing after a long day in the city. The big windows allow for lots of natural light in the apartment, giving it a fresh and clean feel. You´ll also be able to access the balcony from here. What´s more, there is also a big dining table where you can enjoy your very own home-cooked meals prepared in the fully equipped kitchen, complete with coffee maker, kettle, juicer and more. The apartment has two bedrooms and one bathroom, allowing up to 6 people to stay here comfortably. The main bedroom has a double bed, while the other bedroom has two single beds. The apartment comes with many amenities, such as an Internet connection, a washing machine and a dishwasher. 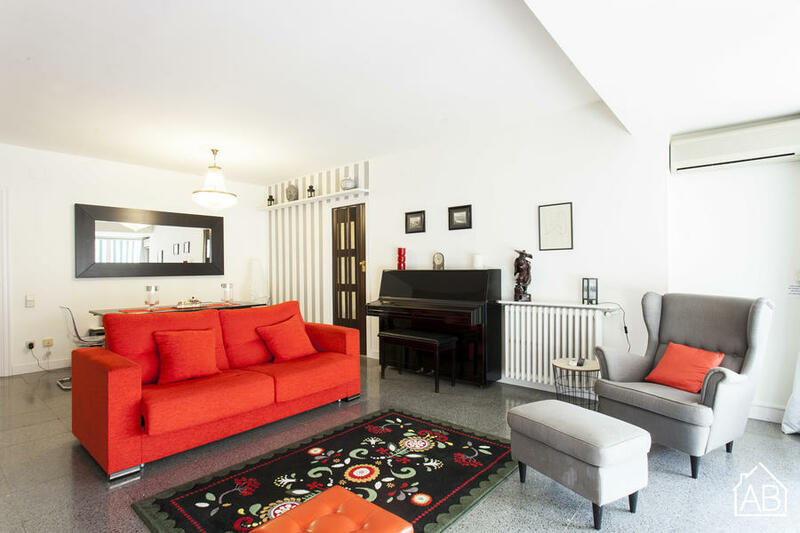 Complete with central heating and air conditioning, this apartment has everything you need to make you feel at home during your time in the Catalan capital.